Fully automatic, not even a button to push! New electric foil cutter technology easily cuts and removes foil in seconds. Then flip it over to effortlessly remove natural or synthetic corks upon contact. Blue light shines when in use and on the charger. Battery life indicator lets you know when it’s time to charge. Sleek stainless steel body with with charging stand. BEST ANSWER: The Electric Blue Automatic Wine Opener & Foil Cutter comes with rechargeable batteries which can be easily replaced. You can purchase rechargeable batteries from your local supermarket or office supply store. Do you ship to the United Kingdom? If so what is the shipping cost. Regards Elaine W.
will it open sparking wines? BEST ANSWER: The Electric Blue Automatic Wine Opener & Foil Cutter is not designed to open sparkling wine or champagne. I suggest the Carbon Fiber Champagne opener. I’ve lost the charger for my model KP1-36N1 electric wine opener. Adaptor model YH-U35060080D. Is there a way to replace it? Love the opener. How do you replace the batteries in the electric blue? I bought mine in December 2017. Great party gift for anyone. Perfect gift for my wine drinking friends. They were quite impressed at how easy it worked. The other guests loved it too. The way it lit up was way COOL! This is a well engineered, high quality tool which looks and works great. It has been a real hit with all friends and family members to whom we gifted this device for the Holidays! We love this opener..easiest way to open a bottle of wine! Great wine opener and foil cutter! I charged it for 24 hours as directed by the instructions and it is still holding a charge more than two weeks later. The foil cutter works great, it only takes about 10 seconds for removal. The wine opener works as advertised quickly removing the cork and ejecting it. I like the stainless steel and the slim profile. It doesn't take up much room. I hope to use it for many years to come. I had another brand and it broke. So far this one is working great. I really like the ease of operating it. The foil cutter is nice. It lights up blue to let you know it is working. Goes down and then pulls the cork up and afterwards it drops the cork out. Just need to use a little pressure while you’re holding it down. I found that the foil cutter is inconsistent, depending on the type of foil wrapper used. Not Happy, The first one would not cut the foil and the replacement would not cut the foil. I recommend this wine opener. Gave it to my husband fir Christmas. He has bad arthritis in his hands. He loves it. I don’t know how I ever lived without it.I lOVE it ?? Works as stated. It’s pretty astonishing really. I’ve never opened a bottle so fast! I love it. I have had several other ones over the years but this is the best! However I never found that “reset tool; do not need it now but maybe someday I will. This is the easiest device of its kind that I have used. Of course, it's only a few weeks old, so remains to be seen how long the battery will last. At least, you are supposed to be able to replace the chargeable battery in this one. Simply...I really like this product. As advertised! I like the wine opener. The wine opener is just what the doctor ordered. I need to drink one glass of wine each day. For 78 year old, it is an easy open tool. I like it. We first used the Electric Wine opener during the Christmas holiday. I must say it is great. It does everything you would expect from an electric opener and more. Would recommend it to everyone. this is a very handy device. The foil cutter is fabulous and the corkscrew works very, very well. Buy with confidence. Great product. Love the foil cutter. Even better is when it pulls the cork, it rotates back and pops out the cork! Does not remove foil easily. Does remove corks well and I like that you can see the cork being removed. My wife saw this at a friend’s home and wanted one, believing it would be easier for her to use than the various other wine openers we have. It took a couple of uses before it became easy to master. One must hold the bottle firmly in place while using the foil cutter, since the electric motor has so much torque, it will otherwise spin the bottle on a hard surface instead of cutting the foil. Similarly, one must apply firm downward pressure on the bottle, keeping the opener perfectly vertical, for the device to easily remove the cork. Now that we have been using it for a couple of weeks, it has proven to work as well as advertised and worth the purchase price. 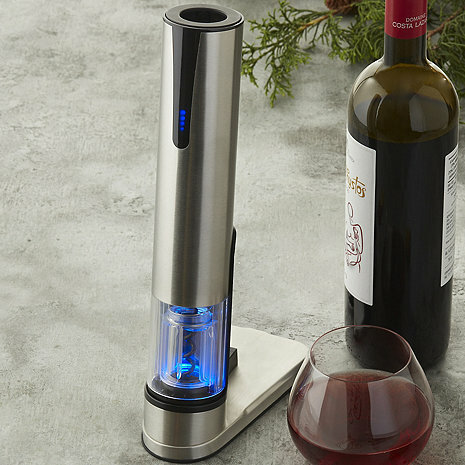 The Electric Blue Automatic Wine Opener and Foil cutter is attractive; it looks modern and sleek on my kitchen counter. The wine bottle opener works very well; it is fast and efficient. Unfortunately the foil cutter is not compatible with all wine bottles. It works well on smaller bottles with a thin foil. For your wine bottles that have a thicker foil, keep a knife and/or handheld foil cutter handy. Draws corks very effectively, and is easy to use. Decapsulates many bottles efficiently, though not Burgundy bottles. The wine opener is wonderful the foil cutter not so much. AN UPGADE SINCE LAST MODEL, EASY TO USE EXCEPT FOR THE CAPSULE REMOVER END-DOESN'T WORK ON MOST BOTTLES! The corkscrew is excellent except for very old corks and dense synthetics. The capsule cutter does not work well. All in all a good product. The opener works fantastic. The foil cutter no so much. The four cutting circles don't reach far enough to make contact with ther could to cut it. Not good. Cork remover works great but the foil cutter not so good. I would just buy the one that has the cork remover. We like the wine opener. We just hope one last longer then the past 4. Love the way it opens the bottle of wine but the foil cutter does not work.